I have the 7982 AP right now in Basement ceiling because that where's most my AV equipments are. My ISP gave me 150 mb download and 20mb upload. Or I need second AP in the basement and call it a day. Here is a long answer. Test it in the basement standing under the WAP. This test will show you your maximum connection speed ("in vacuum") that you will get. Test your WiFi and your infrastructure separately. Start with SpeedFlex for Ruckus and move on to doing iPerf between 2 wired devices on the wire network. That will show you how fast is your infrastructure in the air as well as on the wire. From there you can make a decision about another WAP. Keep in mind that the device you are testing your wireless with does matters. Your WAP is 3x3 MIMO. That means that if if your device does not support that, you will see "slower speeds". Test with latest and greatest handhelds (Galaxy S7 and higher, iPhone 7s and higher, Ipad get 4 and higher) for best results. Also, introducing 80Mhz channels and AC radio and 160 MHz channels on AC Wave 2 on 5Ghz will significantly increase throughput to your devices (if they can support that). That would mean adding R510, R610 or even R720 would make a big difference in speeds (if your devices can support and your network and gateway can deliver). Move with the technology. Upgrade everything to gigabit (2.5/5 Gigabit soon enough) and switch to 5 Ghz AC technology. Upgrade your client devices to AC and add equipment for coverage if money is not an issue. That would get you to the fastest Wi-Fi and equipment that can actually use it. Are you connected with 2.4 GHz or 5 GHz? Have you tried using a WiFi analyzer to see congested channels and setting it to a static one? I have a 7982 on the basement floor (not mounted) and it provides good signal throughout a 2 story house (basement, main, upper) but YMMV depending on your home construction. 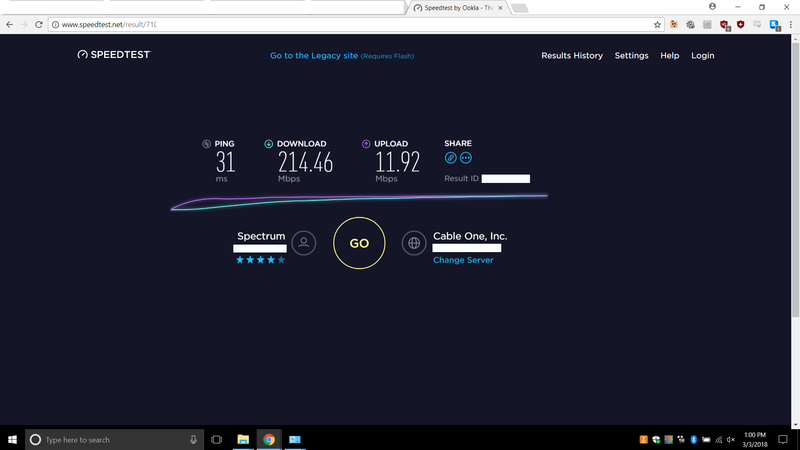 With Spectrum 200 / 10 Mbps plan, I typically get ~200 Mbps when doing speed tests in the same room using an older ThinkPad W520 with the Intel® Ultimate-N 6300 WiFi card (3x3 801.11n). This is what I get through 3 floors with a Samsung Galaxy Note 4. 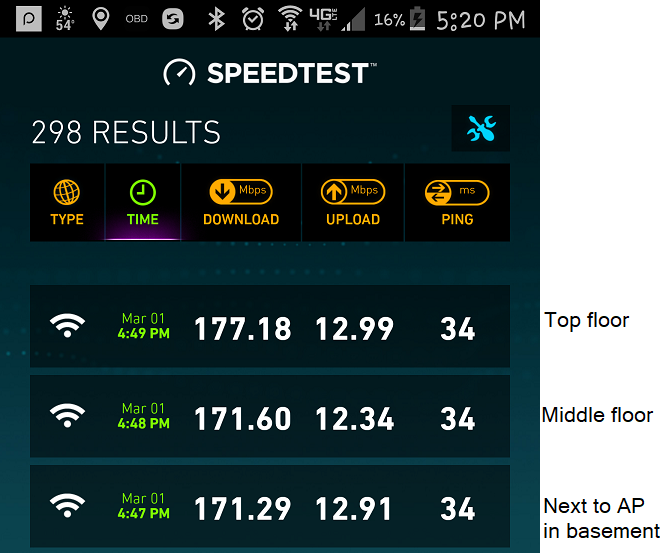 My main AP is the Ruckus R500 using Unleashed firmware on the main floor behind a TV and results are similar. I'd try using 5 GHz on a static channel first and see if your results improves.